Relevant topical films frequently fall into the trap of overstatement. But here is where Why Cheat India scores high marks. It succeeds avoiding the imbalance between topicality and engagingness by simply letting the actors be. The characters in this film exposing the scam of forged duplicate examinees don’t quite develop into the explosive entities they promise to. Their working class psyche shines in their disability to generate spectacular drama. Hearts are broken, young lives are destroyed, marriages fall apart, and ambition dissolve…But life goes on. 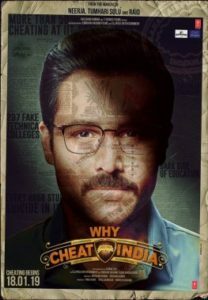 Why Cheat India is not about Rocky’ wife. It’s about his hunger to create a ‘New” India with underprivileged and perhaps undeserving students being given a push by substitute candidates writing their examination papers. This life of shocking duplicity never elicits harsh censure in the film. The narrative’s tone suggests that our social order gets the kind of moral structure that it deserves. This is a film about unfulfilled dreams and abducted yearnings, shot by cinematographer Y. Alphnose Roy about a brilliant student called Sattoo (impressive newcomer Singhadeep Chatterjee) whose career is destroyed by Rocky’s patronage. I felt the bonding between the student and his mentor was not played out closely enough. We never feel Satoo’s disappointment. The growing relationship between Rocky and Sattoo’s sister (outstanding discovery Shreya Dhanwanthary) gets far more space to breathe. 16 queries in 0.539 seconds.